For another first round of the pandemic, see First cholera pandemic. 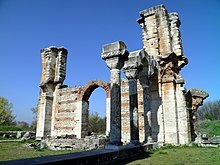 Partially-completed basilica in Philippi; its construction is believed to have been halted by the Plague of Justinian. When pestilence swept through the whole known world and notably the Roman Empire, wiping out most of the farming community and of necessity leaving a trail of desolation in its wake, Justinian showed no mercy towards the ruined freeholders. Even then, he did not refrain from demanding the annual tax, not only the amount at which he assessed each individual, but also the amount for which his deceased neighbors were liable. As a result of the plague in the countryside, farmers could not take care of crops and the price of grain rose at Constantinople. Justinian had expended huge amounts of money for wars against the Vandals in the region of Carthage and the Ostrogoths' kingdom in Italy. He had dedicated significant funds to the construction of great churches, such as Hagia Sophia. As the empire tried to fund the projects, the plague caused tax revenues to decline through the massive number of deaths and the disruption of agriculture and trade. Justinian swiftly enacted new legislation to deal more efficiently with the glut of inheritance suits being brought as a result of victims dying intestate. The Romano-British may have been disproportionately affected because of trade contacts with Gaul and other factors, such as British settlement patterns being more dispersive than English ones, which "could have served to facilitate plague transmission by the rat". The differential effects may have been exaggerated. British sources were then more likely to report natural disasters than Saxon ones. In addition, "the evidence for artifact trade between the British and the English" implies significant interaction and "just minimal interaction would surely have involved a high risk of plague transmission". However, scholars (like L. Lester in their Plague and the End of Antiquity: The Pandemic of 541–750), as evidence that the plague damage done on the Sub-Roman Britons was greater than the one suffered by the Anglo-Saxons, believe that the sudden disappearance around 560 of the important Roman town of Calleva was probably due to the Plague of Justinian, which later created a kind of curse on the city "damned" by the Anglo–Saxons. The outbreak of the plague was coincided with the Lazic War between the Byzantine and Sasanian empires. The plague affected the advancing Persian army under Khosrow I, which was forced to retreat. Justinian I quickly used the opportunity and invaded Persia, but the campaign was unsuccessful. 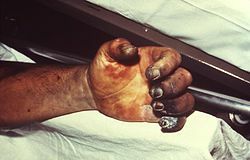 After the last recurrence in 750, pandemics on the scale of the Plague of Justinian did not appear again in Europe until the Black Death of the 14th century. ^ Floor, Willem (2018). Studies in the History of Medicine in Iran. Mazda Publishers. p. 3. ISBN 978-1933823942. The Justinian plague (bubonic plague) also attacked the Sasanian lands. ^ Rosen, William (2007), Justinian's Flea: Plague, Empire, and the Birth of Europe. Viking Adult; pg 3; ISBN 978-0-670-03855-8. 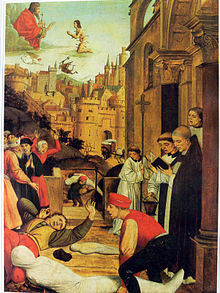 ^ "The Plague of Justinian". History Magazine. 11 (1): 9–12. 2009. ^ Christakos, George; Olea, Ricardo A.; Serre, Marc L.; Yu, Hwa-Lung; Wang, Lin-Lin (2005). Interdisciplinary Public Health Reasoning and Epidemic Modelling: the Case of Black Death. Springer. pp. 110–14. ISBN 3-540-25794-2. ^ a b Procopius, Anekdota, 23.20f. ^ "Modern lab reaches across the ages to resolve plague DNA debate". phys.org. May 20, 2013. ^ Maria Cheng (January 28, 2014). "Plague DNA found in ancient teeth shows medieval Black Death, 1,500-year pandemic caused by same disease". National Post. ^ a b Eroshenko, Galina A.; et al. (October 26, 2017). "Yersinia pestis strains of ancient phylogenetic branch 0.ANT are widely spread in the high-mountain plague foci of Kyrgyzstan". PLOS One. 12 (10): e0187230. Bibcode:2017PLoSO..1287230E. doi:10.1371/journal.pone.0187230. PMC 5658180. PMID 29073248. ^ a b c Damgaard, Peter de B.; et al. (May 9, 2018). "137 ancient human genomes from across the Eurasian steppes". Nature. 557 (7705): 369–374. Bibcode:2018Natur.557..369D. doi:10.1038/s41586-018-0094-2. PMID 29743675. Retrieved September 28, 2018. ^ Morelli, Giovanna; et al. (October 31, 2010). "Yersinia pestis genome sequencing identifies patterns of global phylogenetic diversity". Nature Genetics. 42 (12): 1140–1143. doi:10.1038/ng.705. PMC 2999892. PMID 21037571. Retrieved September 28, 2018. ^ Wagner, David M.; et al. (April 2014). "Yersinia pestis and the Plague of Justinian 541–543 AD: a genomic analysis". The Lancet. 14 (4): 319–326. doi:10.1016/S1473-3099(13)70323-2. PMID 24480148. Retrieved September 28, 2018. ^ Rasmussen, Simon; et al. (October 22, 2015). "Early Divergent Strains of Yersinia pestis in Eurasia 5,000 Years Ago". Cell. 163 (3): 571–582. doi:10.1016/j.cell.2015.10.009. PMC 4644222. PMID 26496604. Retrieved September 28, 2018. ^ McGrath, Matt (12 October 2011). "Black Death Genetic Code 'Built'". BBC World Service. Retrieved 12 October 2011. ^ Bos, Kirsten; Schuenemann, Verena J.; Golding, G. Brian; Burbano, Hernán A.; Waglechner, Nicholas; Coombes, Brian K.; McPhee, Joseph B.; Dewitte, Sharon N.; Meyer, Matthias; Schmedes, Sarah; Wood, James; Earn, David J. D.; Herring, D. Ann; Bauer, Peter; Poinar, Hendrik N.; Krause, Johannes (12 October 2011). "A draft genome of Yersinia pestis from victims of the Black Death". Nature. 478 (7370): 506–510. Bibcode:2011Natur.478..506B. doi:10.1038/nature10549. PMC 3690193. PMID 21993626. ^ "Justinian's Plague (541-542 CE)". ^ Procopius, History of the Wars, 7 Vols., trans. H. B. Dewing, Loeb Library of the Greek and Roman Classics, (Cambridge, Mass. : Harvard University Press, 1914), Vol. I, pp. 451–473. ^ a b c Nicholas Wade (October 31, 2010). "Europe's Plagues Came From China, Study Finds". The New York Times. Retrieved 2010-11-01. ^ John of Ephesus, Ecclesiastical History, part 2. Translation of relevant portions here. ^ Evagrius, Historia Ecclesiae, IV.29. ^ Procopius, Persian War II.22–23. ^ Justinian, Edict IX.3; J. Moorhead 1994; Averil Cameron, The Mediterranean World in Late Antiquity, AD 395–600, 1993:111. ^ Rosen, William. Justinian's Flea: Plague, Empire, and the Birth of Europe. Viking Adult, 2007. Pg. 321–322. ISBN 978-0-670-03855-8. ^ John S. Wacher (1974, pp. 414–422); J.C. Russell (1958, pp. 71–99). ^ Josiah C. Russell, Medieval Demography, New York, AMS, 1987, p. 123. ^ a b Neville Brown, History and Climate Change: An Eurocentric Perspective, Routledge, London, 2001, p.94–95. ^ Cyril A. Mango, Byzantium: The Empire of New Rome (1980) emphasizes the demographic effects; Mark Whittow, "Ruling the late Roman and Byzantine city", Past and Present 33 (1990) argues against too great reliance on literary sources. Harbeck, M; Seifert, L; Hänsch, S; Wagner, DM; Birdsell, D; et al. (2013). "Yersinia pestis DNA from Skeletal Remains from the 6th Century AD Reveals Insights into Justinianic Plague". PLoS Pathog. 9 (5): e1003349. doi:10.1371/journal.ppat.1003349. PMC 3642051. PMID 23658525. Drancourt, M; Roux, V; Dang, LV; Tran-Hung, L; Castex, D; Chenal-Francisque, V; et al. (2004). "Genotyping, Orientalis-like Yersinia pestis, and plague pandemics". Emerging Infectious Diseases. 10 (9): 1585–1592. doi:10.3201/eid1009.030933. PMC 3320270. PMID 15498160. Little, Lester K., ed. (2006). Plague and the End of Antiquity: The Pandemic of 541–750. Cambridge. ISBN 978-0-521-84639-4. McNeill, William H. (1976). Plagues and Peoples. New York: Bantam Doubleday Dell. ISBN 978-0-385-12122-4. Moorhead, J. (1994). Justinian. London. Orent, Wendy (2004). Plague, The Mysterious Past and Terrifying Future of the World's Most Dangerous Disease. New York: Simon & Schuster. ISBN 978-0-7432-3685-0. Russell, J. C. (1958). "Late Ancient and Medieval Population". Transactions of the American Philosophical Society. New Series. 48 (3): 71–99. doi:10.2307/1005708. JSTOR 1005708. Wacher, John S. (1974). The Towns of Roman Britain. Nature. 98. Berkeley: University of California Press. p. 468. Bibcode:1917Natur..98Q.468.. doi:10.1038/098468a0. ISBN 978-0-520-02669-8. Edward Walford, translator, The Ecclesiastical History of Evagrius: A History of the Church from AD 431 to AD 594, 1846. Reprinted 2008. Evolution Publishing, ISBN 978-1-889758-88-6. —The author, Evagrius, was himself stricken by the plague as a child and lost several family members to it. Procopius. History of the Wars, Books I and II (The Persian War). Trans. H. B. Dewing. Vol. 1. Cambridge: Loeb-Harvard UP, 1954.—Chapters XXII and XXIII of Book II (pages 451–473) are Procopius's famous description of the Plague of Justinian. This includes the famous statistic of 10,000 people per day dying in Constantinople (page 465).